VFW Student Scholarships - Available to all students! VFW Post 10066 offers scholarships for students in 6th - 8th grades and 9th - 12th grades with opportunities for winners to advance to state and national competitions. First-place winners receive $5,000 and $30,000 at the national level, plus monetary prizes awarded from the local, district and state levels and trips to state and national competitions. Theme "Why My Vote Matters" for students in 9th through 12th grades. Theme "Why I Honor the American Flag" for students in 6th, 7th and 8th grades. ENTRY DEADLINE: Oct. 31, 2018. VFW Post 10066, 1805 NE Savannah Road, Jensen Beach, FL 34957. 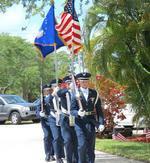 Patriot's Pen applications may be emailed to VFW Post 10066 at scholarships@vfwjensenbeach.org. Email any questions to scholarships@vfwjensenbeach.org.